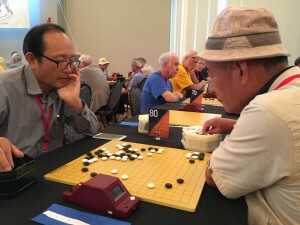 Wei Ding and Dalhoon Ahn leading in Masters: Wei Ding and Dalhoon Ahn are in the lead in the US Open Masters, undefeated after four rounds. With 3-1 records are Ryan Li, Bin Fu, Zirui Song and Andy Liu. Click here for complete results – and top-board game records. 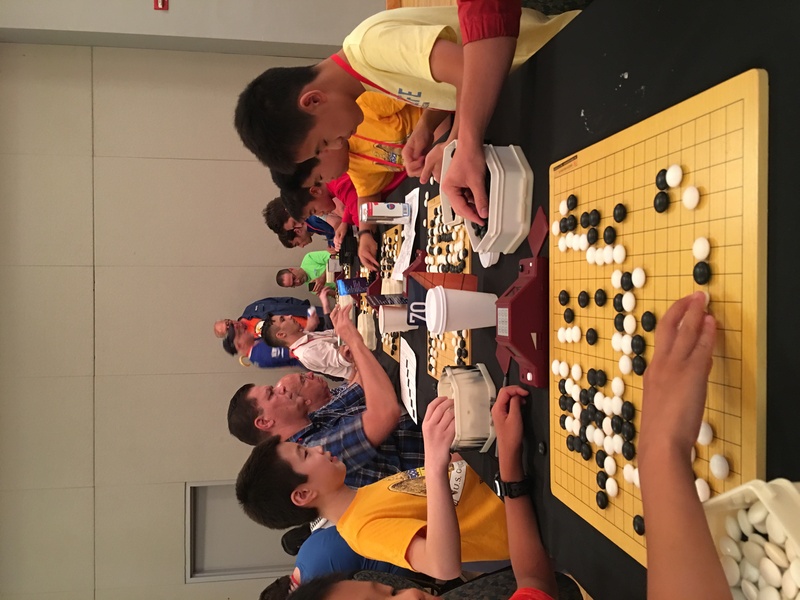 Click here for the US Open crosstab; add your game records by sending them to journal@usgo.org. Seniors tourney popularity grows: In just its third year, the Seniors Tournament has steadily grown in popularity, and this year, with Greg Kulevich directing, exceeded the original 40-player cap with a total of 46 participants. After two rounds, front-runners have emerged, but there are still two more rounds to play. Blackout at the Lightning Tournament: Judging strictly by decibel level, the Lightning Tournament certainly sounds like the most fun, as stones fly and clocks are punched. This year saw an extra challenge, as the lights went out in the middle of the tournament (it was that kind of day; in mid-afternoon the Sadler Center was evacuated briefly when an overheated sensor set of fire alarms). Luckily the blackout didn’t last long, but every second counts in a game that is only 10 minutes with sudden death. 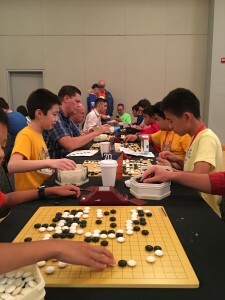 Despite competition from a number of other popular offerings, the Lightning attracted 80 players on Monday night, split into tables of six competing in a fast-paced round robin style. Dan table winners: Willis Huang 6d, Tianyuan Zhang 5d, Andrew Zalesak 3d, Soren Jaffe 4d, King Bi 3d, Jake Game 1d. Kyu table winners: Terry Wang 2k, Billy Maier 3k, Tony Zhang 3k, Benjamin Coplon 5k, Tevis Tsai 6k, Tsulmuun Ganbatoor 8k, Josh Johnson 14k, Tonya Perez-Lopez 20k. Playoffs continue through the week; Keith Arnold, as always, directed.